We try really hard to grow our crops in a environmentally sound manner especially concerning crop nutrients. We are fortunate to be farming only nearly level fields so that soil erosion is not a problem. Our primary concern is to apply only the correct amount of the correct type of plant nutrients...and to apply them at the correct time and to apply them in a correct manner. We use a lot of soil testing on a 2.5 acre grid. This means that the following example field of 158.11 acres had 63 separate samples of soil taken and analyzed for such things as % organic matter, Cation Exchange Capacity, phosphorus, potash and soil ph (to determine the need for lime). The above is the test results for phosphorus and shows a wide variance of availability of this important nutrient...but notice that while the northwest part of this field is very low in available phosphorus the southwest and southeast parts are in pretty good shape. This second page shows the recommended amount of the fertilizer of choice, Di-Ammonia Phosphate, to apply and exactly where to apply it. Notice that over 40% of the field will receive zero amount of this fertilizer...good for the environment and good for our budget! The fertilizers are applied using a multi-compartmented truck that continuously varies the amount of different fertilizer products as it is driven thru the field. 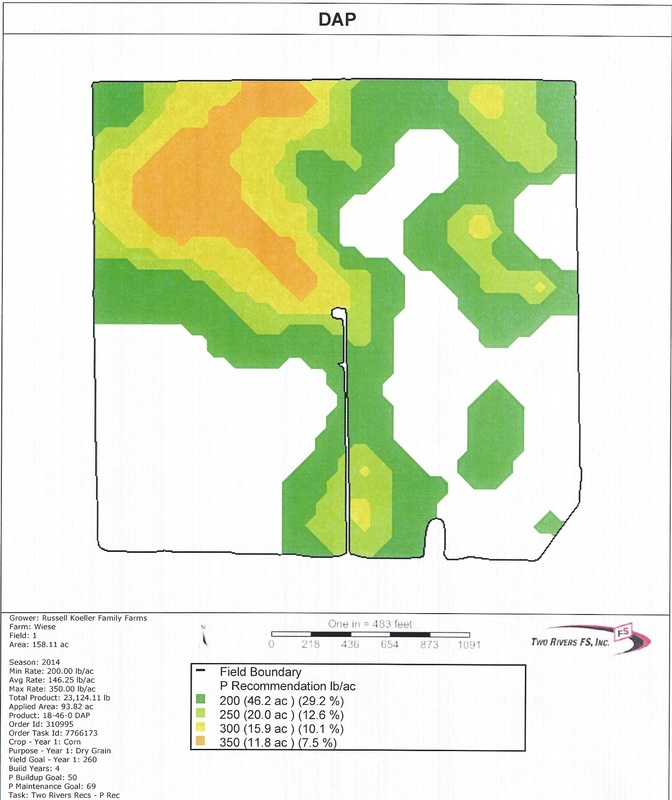 The fertilizer recomendations have been uploaded into the controler and GPS correlates this to the location in the field....so...the right amount of the right product in the right location! We do exactly the same procedure with lime when it is needed to raise the soil ph, only we use a single compartment truck. Lime (crushed limestone) is often applied at a rate of 2 or 3 tons per acre. Kris is applying anhydrous ammonia which is the most economical form of nitrogen fertilizer to apply. It is applied as a liquified gas under about 100 psi and is 82% nitrogen. We usually apply 200 pounds or more per acre of actual nitrogen units. 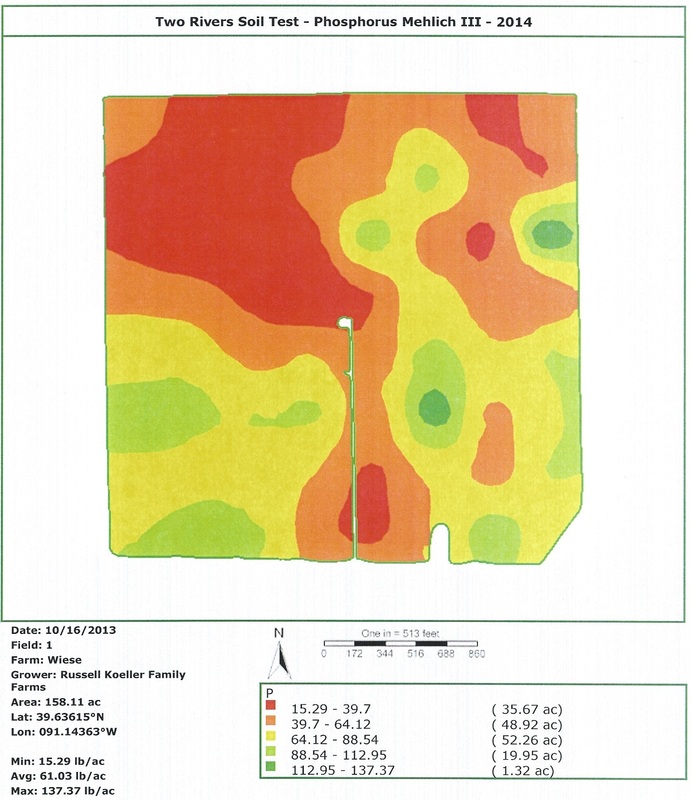 Currently we use variable rate technology to vary the application rate as we cross each field, taking into consideration soil type, fertility, irrigation and past yields. Remember...nitrogen is an inert gas and is by far the most common chemical in the air that we breathe...approximately 78% of our air is nitrogen! Each time it rains or snows some of this nitrogen comes back to earth to fertilize all grass, trees and crops.